There are four distinct developmental stages to the Learning & Development progression. They are: entering, emerging, advancing, and mastering. In addition, there are six areas of growth within each stage of development. They are: expertise, scope, organization focus, value to system, commitment to profession, and experience. Using this framework, a professional can identify where they are in their professional progression and complete a gap analysis of the competencies and performance standards. Through the gap analysis, the areas of competence and performance will indicate higher levels and lower levels of attainment, knowledge, and growth. 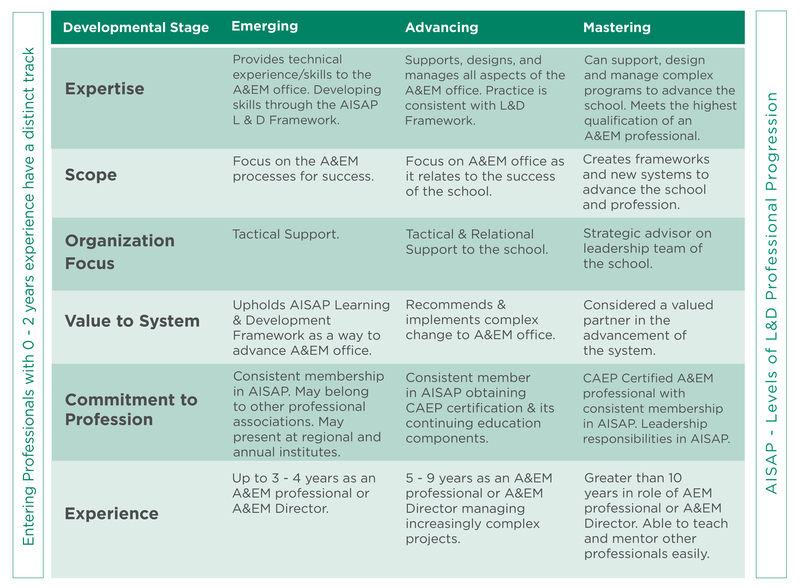 Using this self-analysis, the A&EM professional can focus on the areas that are in need of strengthening and improvement through the many educational opportunities that AISAP has to offer at the Annual Institute and throughout the coming year.